I'm going to be completely honest here, I've been dragging my feet writing this second post because I let so much time go by already! 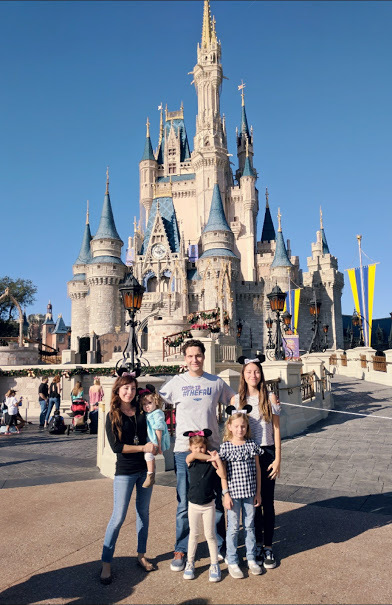 I haven't even been posting about Christmas festivities because I felt like I had to write about our trip to Magic Kingdom next because I said I would. Haha! I'm going to try to keep this brief so I can move onto other things I want to talk about at this point. So if you're new, I'd refer to my last post here about our first trip to Disney World and some info on how we survived the trip with 4 kids, 3 under 6. I'm still laughing at myself thinking they were going to be the best behaved kids because it's Disney World. Ha. Joke was on me. Anyhow here are some pictures. I have to say I was in major awe of Cinderella's castle. It's even more beautiful in person than just the pictures. I had also never seen it lit up for the holidays so that was a real treat. The rides were great and again like Epcot, we didn't have to wait more than 15 minutes for a ride because we got there as soon as it opened. My two year old really loved small world. It was so cute! We still have more tickets we need to use and want to visit the other parks, but want to go when it's slow. We're thinking late January or early February to visit the other parks. I hope everyone had a great Christmas and if I don't post before then, Happy New Year! Holiday cards made easy with Minted!